Electronics is one of the most lucrative industries in the world, with the global market expected to be valued at $838.85 billion by 2020. No doubt, these electronic appliances and gadgets have made our everyday lives more comfortable and more convenient, and this is thanks in no small part to printed circuit boards or PCBs. PCBs are considered the foundation of electrical engineering, the backbone that holds everything together and the brain that routes the “signals” to the different components to make an electronic device work the way it was designed. From cellphones and remote-controlled toys to game consoles and smart home appliances, a PCB is where it all begins. In simple terms, a PCB is a non-conductive board (typically made of resin or plastic) laminated with a conductive metal, usually copper, onto which electrical components like resistors and capacitors are soldered. A PCB can have anywhere from one to ten layers; the more complex the device, the more components it will need and the more layers its PCB will have. Making a PCB can be broken down into three basic steps: designing the schematics, laying out the design through a software, and the actual manufacturing process. The schematics serves as the roadmap of the PCB. It’s also a helpful troubleshooting tool should there be any issues with the PCB later on. Meanwhile, the digital layout acts as the primary set of instructions as to where the components will be placed. This is usually in Gerber or CAD file format. Once the Gerber or CAD file is in place, the production phase can begin. Depending on the requirements, a PCB may be manufactured through different methods, like single- or double-sided fabrication, through-hole, or surface-mount technology or SMT. 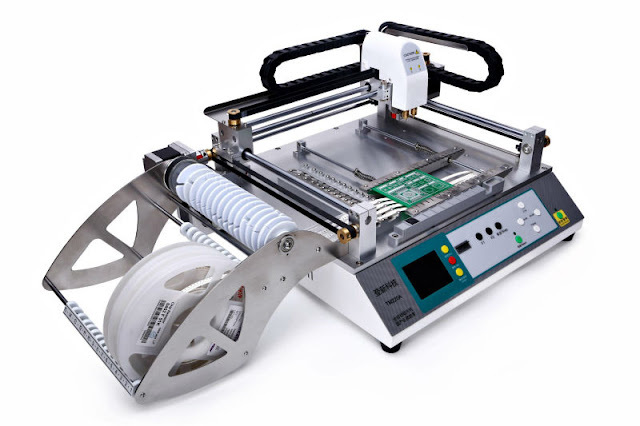 The latter is the most common technology used in manufacturing PCBs, with the use of pick-and-place assembly machines. Pick-and-place machines or P&Ps are used for high-speed, high-precision placement of electronic components, like integrated circuits, onto PCBs used for consumer electronics, as well as medical, automotive, and telecommunications equipment, among many others. P&Ps are commonly equipped with pneumatic suction cups or nozzles that pick up and place the components onto the PCB. The cups or nozzles are attached to plotters powered by micro brushless DC motors. These can be manipulated independently and accurately in three dimensions. Pick-and-place assembly machines can contain up to 20 or more individual micro motors, depending on a machine’s individual capacity. The higher the number of components that the P&P can handle per cycle, the less frequently will the head move back and forth between the PCB and the receiving point of the components. This results in faster operation speeds. The micro motors in P&Ps also ensure high acceleration and accuracy and repeatability of motions in a small footprint. Given the fast-moving nature of mass-market electronics, quick and accurate production in maximum quantities with minimum changeover are valuable aspects in an industry where time can literally mean money. P&P assembly machines operate on a simple premise (pick up a component and place it on the board), but their mechanics are the key to the quick production of the building blocks of electronics. P&Ps also help electronics manufacturers worldwide with a cost-effective solution for manufacturing PCBs, and step up to the demands of a highly competitive and continuously evolving industry.